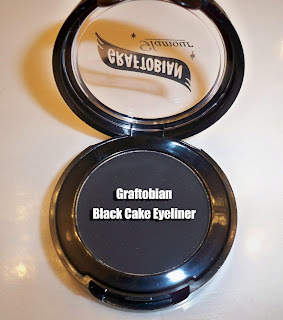 Recently I had the opportunity to test out some products from an amazing professional cosmetics brand Graftobian. I already have several of their items in my kit including a 12 pan Dual Powder Foundation Professional Palette, Cream Blush Palette, Fashion Colors Lip palette, and of course a few of their famous steel palettes and palette knifes (I purchased all of this from CameraReadyCosmetics - one of my fav makeup artist supplier sites). I've been playing with their products for about two weeks and I'm sold...now I want more Graftobian in my kit! In fact, their foundation is giving my beloved Cinema Secrets foundation a run for their money! I have several tutorials planned using these products, but I wanted to give my blog followers a sneak peak. I got my generous package of goodies the same week I moved into my new apartment...what a great housewarming gift! Here's a shot my boyfriend took of me playing with the new makeup! 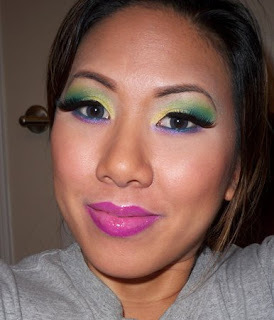 You can see I'm already working on developing a super bright look! 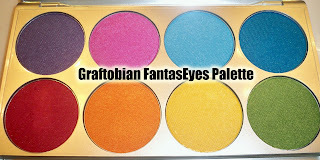 In today's FOTD, I'm focusing on the Graftobian FantasEyes palette. Isn't it beautiful? Bright colors are right up my alley. Each pan is like 4 times the size of a MAC pan eyeshadow, nearly blush size. You can get it in a pre-filled palette like this, or you can buy the empty palette and fill them with pan refills for only $8.5o! A MAC pan eyeshadow is about $10 and it's only a fourth of the size. The empty palette is also only $11.99 - great deal! The pigmentation is amazing...you don't need a bright base underneath to make the colors pop (unlike many eyeshadows out there). I only used a light foundation color as my base in this look. 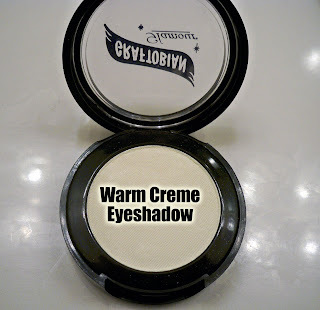 I used the Ultrasilk Matte eyeshadow in Warm Creme as my highlighter color. This huge eyeshadow (a bit bigger than MUFE eyeshadows) is only $9.99. It will last you forever! It's the perfect all over lid color/highlight color in an eggshell tone. I also love using this as a highlighter for the face! I used it on my girl Joy last night, and it made her skin glow! To line my eyes, I used their Black Cake Eyeliner. I've never really used powder liners, but I'm sold on this one! Mixed with their Lining liquid, it's amazing! The powder pan is extra huge once again (the size of their humongous eyeshadow) and I can also use this as matte black eyeshadow...fabulous! Lining the eye with this is a lot easier than using a gel since it doesn't move around...to get the line really black the lining liquid comes in handy. Again this is very reasonably priced at $8.99, great deal! I applied my New York style/drag lashes from Red Cherry and then blended in my real lashes with the Graftobian black mascara. The formula is dryer than some I've tried...this could be a good thing because it will hold curl, but it takes a little more effort to apply. The mascara brush head is pretty typical...but as a makeup artist the brush doesn't really matter since you use disposable applicators anyways. This mascara is very reasonably priced at $10, comparable in price point to most drug store brands. I made my cheeks glow with this fabulous blush...talk about super pigmented! I had to use my fan brush to apply. This would be amazing on any skin tone. This color was a super pretty reddish tone with gold shimmers. Again, a great deal with the individual compact at $9.99! This is half the price of a MAC blush and the quality is equal if not better. And here is my super dramatic look! I wanted to show you how intense the colors can get! Like I mentioned, I just used foundation as an eyeshadow base...most of the colors were applied dry except for the Blue Agua eyeshadow which was applied wet in the outer v. My lips were a combo from MAC: magenta lip liner, magenetique lipglass, and extra amps dazzleglass. 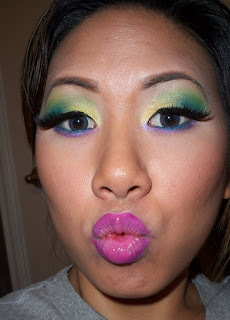 I'm wearing Yellow Ray in my inner 1/3 eyelid, Powder Blue in the middle of the lid, Blue Agua on the outer v, Green flash above the crease, and a combo of Purple Power and Fuschia Fever on the lower lashline. I'm also wearing my Gray Circle lenses in this look, thanks again Anna! 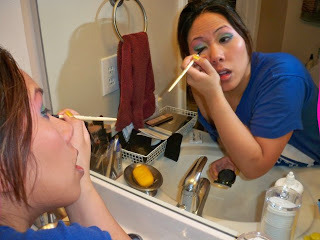 I used a Styli-Style blue eyeliner on my waterline, set with the Graftobian Powder Blue eyeshadow to make it really pop. I'm wearing Graftobian foundation, concealer and powder in this look, but that's another post! Stay tuned for my upcoming videos (already filmed) featuring Graftobian products: Graftobian foundation/contour video, Bright FantasEyes Tutorial (this look re-filmed), Clubbing Look using Graftobian products. Meanwhile check out these products at Graftobian.com or via Camera Ready Cosmetics.com. Honestly, these are amazing quality products at great prices. They aren't some random run of the mill brand, they are a reputable professional grade brand for makeup artists. If you can't afford to buy a pre-filled palette all at one(like the FantasEyes palette), you can buy the empty palettes and buy the refill pans individually (like you'd do at MAC). Gorgeous look, Ren. Those eyeshadows look amazingly pigmented. I love all the colors in that palette! They're so pretty! That look is fantastic! You have just officially made me spend money! Oh wow..those colors are super pigmented. I would have thought MAC or MUFE right away if I didn't know which brand they actually were. gorgeous look! i look forward to checking graphtobian out at the makeup show! oh yeah i remember seeing this on twitter. soo pretty! i actually don't know if i commented yet. hehe. your too damn gorgeous! love ur work of art!